I made the last two pieces for the door for my Greene & Greene cabinet this morning, then spent several hours easing edges and sanding parts up to 320 grit. Frankly, I was pretty worried about being able to pull this off, but so far it looks promising. I measured for each of the muntin/mullion pieces (can we just agree to call them the same thing? Crossbars? Dividers? Thingies? Getting all of the, uhmm, “thingies” to fit was a real load off. At this point it’s mostly details that are missing on the door. The rails need a clout lift cut into them, and all of the edges of the parts get a 1/8″ round over. The step back from the plane of the door to the vertical divider, and again to the horizontal dividers is what makes this door look cool. I pulled the door apart again and rounded all the edges, then sanded everything. Then it was time for a last test fit. 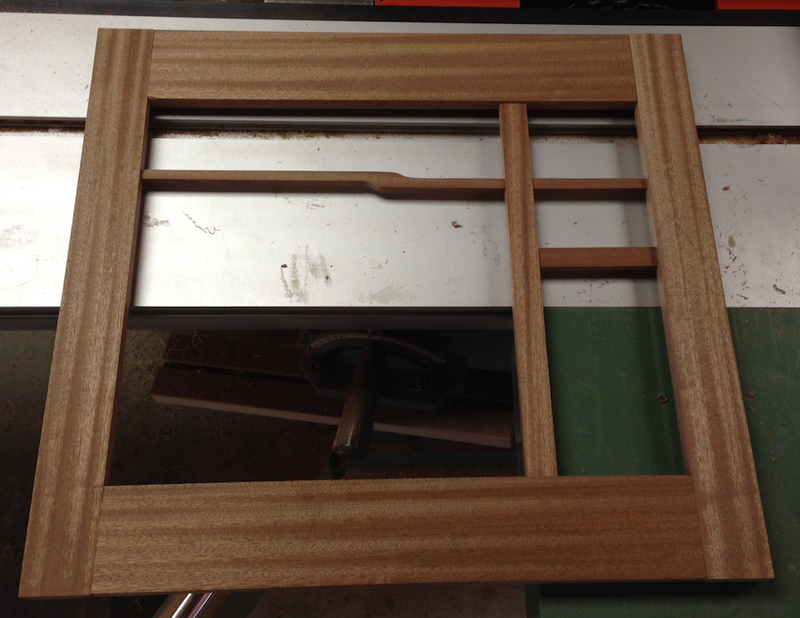 I had one tenon that didn’t seat as cleanly as it should, so I had to debug that problem. I re-checked the fit several times, because once I started with the glue it was too late to make any adjustments. The door looks much nicer now, everything has a softer appearance. Finally, glue up. I tried to avoid getting glue everywhere, and was mostly successful. There wasn’t a lot of squeeze out, almost none in fact (ok, now I’m worried that I didn’t user enough glue). 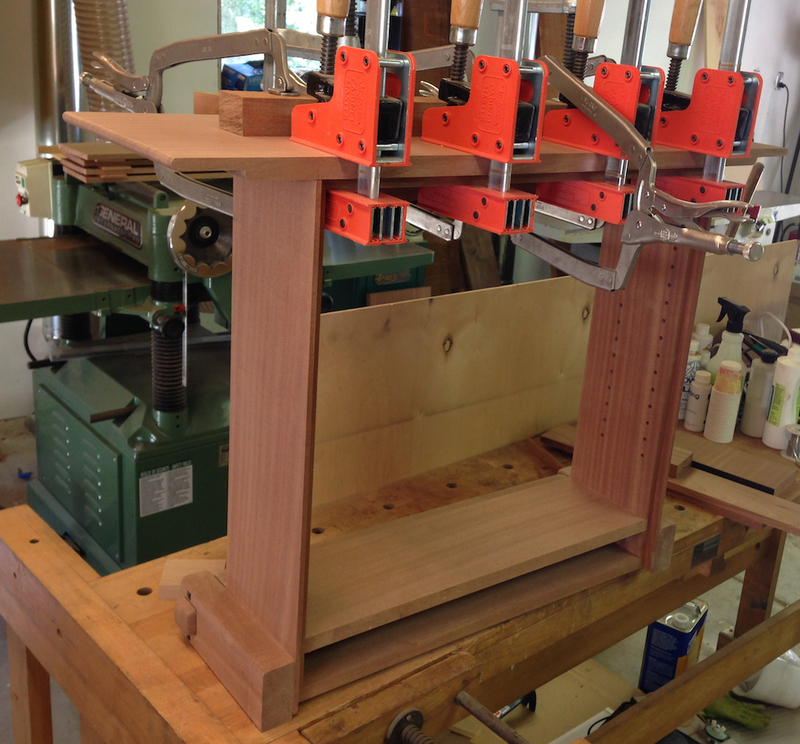 I only put two clamps on it, to draw the mortise and tenon joints tight. there is a little play in the positioning of the crossbars, so I tweaked everything into place and tightened the clamps. I check that the assembly was square, and the the crossbars were square, and left the shop so I wouldn’t keep fussing with it. I used “Old Brown Glue” for this, so if any smears get into the surface of the wood it won’t screw up finishing, and it should have a long enough open-time that I wouldn’t get into trouble with the assembly. 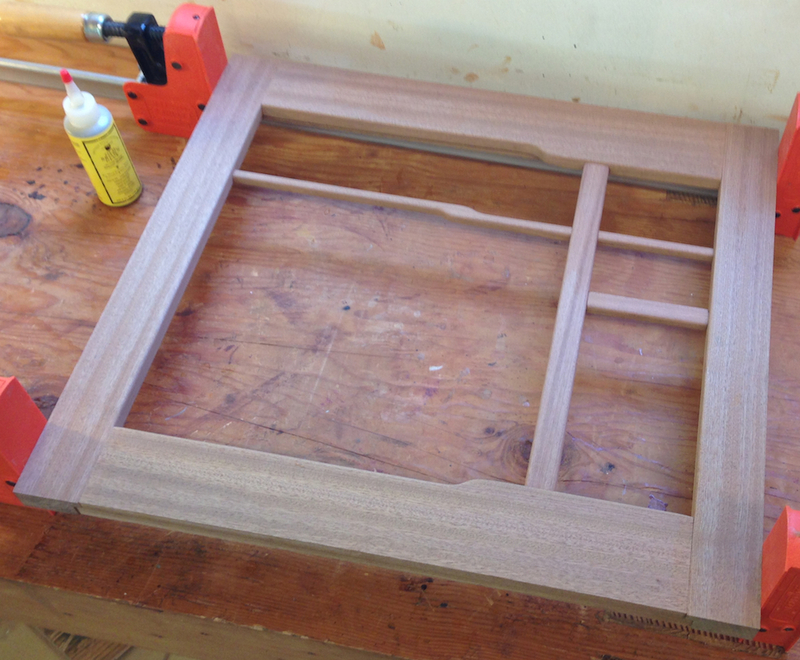 I also pulled the clamps off of the carcass assembly, I glued the top on yesterday. There is a tiny gap between the sub-top and top at the two edges, I don’t think it will show in the finished part but it bugs me. It’s maybe 1/32, and only at the corners. I think the finish will fill it and that will be the end of it. So, what’s left? 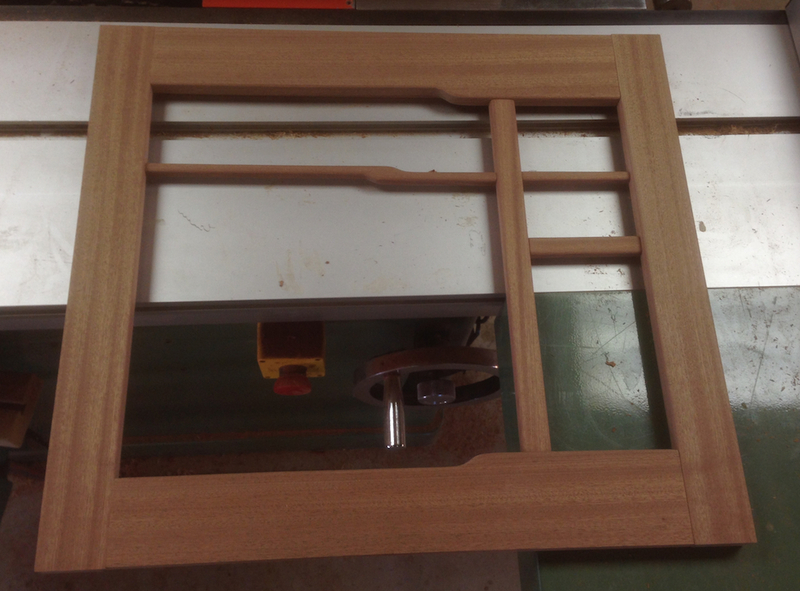 Ebony plugs on the door, hinges and a latch, a few details on the shiplapped back, finishing and the stained glass panel. The door really put me over the hump. Tomorrow I’m driving up to visit the Thorsen House in Berkley to see the original cabinet. You’re a lucky guy to be able to drive to see the original in person. I have to be content with just pictures. Lucky and lazy, I’ve known about it for several years since I got hooked on G&G and haven’t gotten my act together until today to go visit. It will probably inspire several new projects, although my wife is pushing hard for a mission-style bookcase for the guest room.